Hello and welcome to Day 4 of the My Favorite Things November release countdown! For the next five days we're counting down to the November release and sharing cards and projects using all of the new stamps and die-namics. 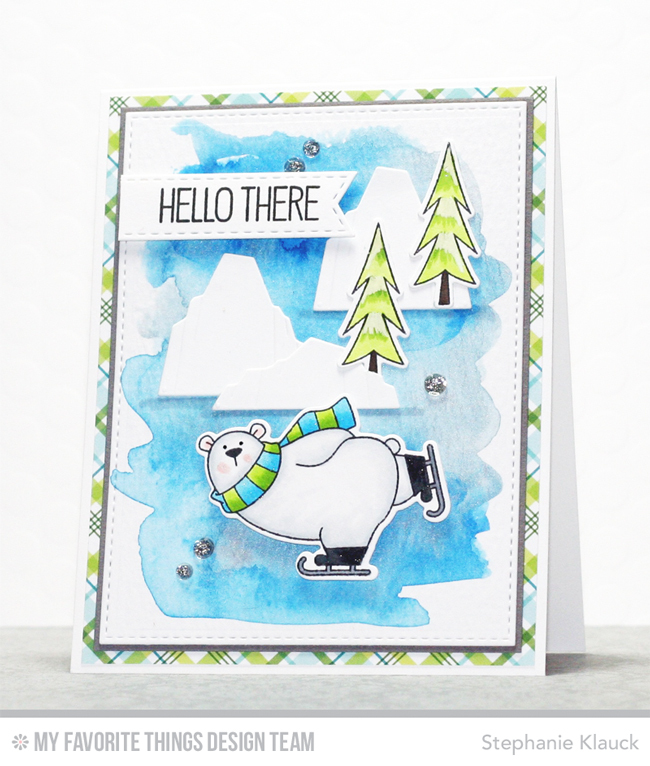 For today's card I used the new Polar Bear Pals stamp set (and coordinating die-namics) along with the new Icebergs die-namics to create a fun, icy scene. I also added some trees into the scene from the new Chill Wishes stamp set. I first created a watercolour background with my Prima watercolours and while that was drying I stamped, coloured and diecut my trees and polar bear. I love the adorable skating bear and couldn't wait to use him on a card! Once the background was dry, I die cut it with a stitched rectangle from Blueprints 29 and adhered it onto a Steel Grey card stock panel. I then added it to a plaid background from the Merry & Bright 6x6 paper pad and adhered it onto a white top-folding card base. I adhered the icebergs, the trees and the polar bear to create an outdoor scene with the polar bear skating on ice. I love the colours on this card and love that the scene turned out exactly how I had envisioned it in my head. The sentiment is stamped on a Stitched Fishtail Flags Stax die with Black Licorice dye ink and tehn I added some clear sequins to complete the card. Thanks so much for joining me for day 4 of the MFT November release countdown! All of the new products that we're sharing this week will officially be available in the MFT online store at 10pm EST on November 1, 2016. What a lovely scene you painted for your bear! My father used to skate just like this, bent over with his hands behind his back. Not sure why they skated that way. Super card! Oh my gosh I love the way you created the icebergs! 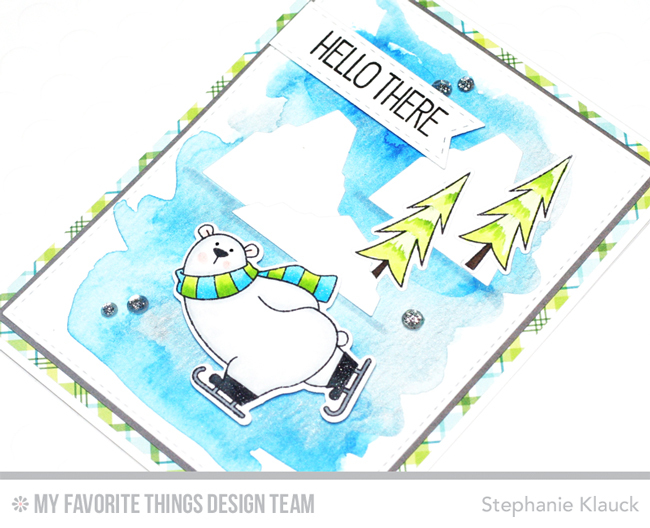 Beautiful coordination of paper and coloring that shows off the wonderful bear! Excellent scenery, with coordinating paper and colors throughout. Stephanie--LOVE this card! Love the plaid layering and the glittery skates...the whole scenario is great! The watercolor sky and the light trees...and the icebergs! All perfectly done! Your coloring is very realistic. It made me chilly just looking at it! Sweet card. This is such a fun scene Stephanie! The polar bear skating is pretty cute! Love this card with all the icebergs.